Hey welcome & thanks for dropping by IdeaWoodworkingPlans.com! We incredibly passionate woodworkers that love sharing the tips & resources that have saved us much time, money & sweat. Our recommended woodworking online training programs & resources have all been tested & vetted by our inhouse team of experts. So grab yourself a cup of your favorite brew, kick back and enjoy.. we look forward to hearing about your woodworking adventures! Like any other profession or hobby, you need to make an investment if you want to become a good woodworker. Making things out of wood is one of the most rewarding and an efficient way of earning. In the past, people used to create things using hand tools because until recently they didn’t have access to the latest power tools which can considerably save time, and help to make an excellent finished product. 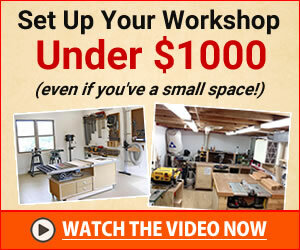 Following are some basic power tools that you need if you are thinking to build a new woodworking shop. The table saw is extremely important for a woodworker’s shop, especially, where many peace of wood are made on a daily basis. It is considered as a stable of the woodworker’s shop. If you have not used it before, you can’t imagine the kind of accuracy, quickness, and stability it provides. If you use a hand saw, your cuts might be off, or the edges may not be straight, and it might take many days to make a peace of wood like a simple table. On the other hand, a table saw helps you to make straight and accurate cuts, saves you time, and reduces your efforts. You can easily get a good table saw somewhere around $200-$950. A Belt Sander helps to save time considerably and saves a lot of tedious hard work. It provides a quick once over that is needed before applying the finishing touch. Normally it costs you somewhere around $100-$200. These are hand held saws used for accuracy and quickness. Different sizes and colors are available in the market so you have a better range to choose one from. A table saw is not always the best option, circular saws are better to use for a quick action. As these saws are hand-held, you will need to practice to become good at using it. Most importantly, circular saws are best to make straight cuts. You can avail it in about $200. Though, it is not a woodworking tool, it is necessary as the buildup of wood dust can be dangerous for you. So you must clean your shop after every use. Other than those mentioned above, you have to use nails, hammers, cordless drills, and some other equipment as well. If you are healthy and safe, you can earn anytime in your life. Ensure safety measures first, and then prefer to work. Wear safety goggles, gloves to prevent injury, ear protection if you are using power tools, avoid loose fitting cloths instead use denim or some other thicker material. Thick clothing will help to prevent you from flying wood chips, and heat. Never use any kind of jewelry while working as it can be snagged by any of the tools you are using.